Corporate Bus Rental and Contract Transportation in Southwest Ontario. When travel is pivotal to your business success, you need dependability. 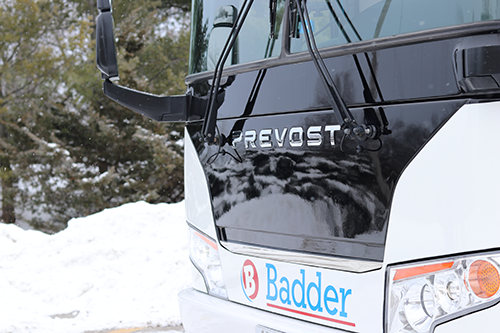 At Badder Bus, we’ll secure your bus travel needs for you. Our trained and friendly drivers are backed by a team of professionals. We’re always connected to ensure timely and accurate details for your trip. Ask about our custom bus wraps with your contract. I would like to sincerely thank you and the Badder team for your services last evening. My drivers were friendly, cooperative, flexible and on time, all of which were extremely appreciated on my behalf. I would not hesitate to recommend those drivers and Badder to anyone, and will definitely contact you when organizing any future endeavors. I want to extend to you a huge thank you for all of the help that you gave me planning the McMaster Welcome Group's trip to Niagara Falls. The trip was a huge success; it had a very positive impact on all 100 of the Syrian refugees that took part. The smiles were abundant and the laughter was loud, despite the terrible weather. This is the first time I have ever planned something like this and I truly believe that the trip could not have been such a success without your help and patience. Additionally, the bus drivers that we had on for our trip were accommodating, kind, and nothing short of outstanding. Working with Badder Bus was an absolute pleasure and I thank you from the bottom of my heart. I look forward to working with you again in the future. At Badder Bus, we understand your corporate travel needs. We’ve served Southwestern Ontario for over 65 years.